The Pensionmark team becomes your team from day one. Our centralized service model gives you a personalized back-office. Let our specialists take care of time-consuming tasks that come with growing and successful practices. You’re free to focus on important things like advising current clients and acquiring new ones while retaining your independence. Change the way you spend your day. 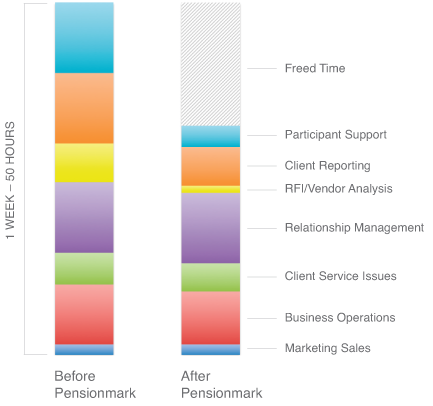 Here’s what an advisor’s time can look like before and after Pensionmark. When you affiliate with Pensionmark, you become part of a powerful network of successful independent advisors. Pensionmark advisors help each other. We share insights, ideas and best practices. It’s a unique collaborative culture, and it translates into better results for you and your clients. 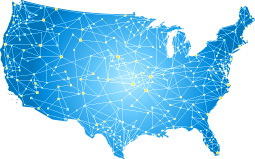 Affiliate structure Advisors maintain independence and ownership of their business. Back office support coupled with leading-edge technology Industry leading tools and the infrastructure and support to help manage them. Objectivity No product or investment mandates and no “pay to play” deals or conflicts of interest. Built by advisors Support and compliance teams that understand your business. Change can seem daunting, but our onboarding process makes your transition to Pensionmark smooth and seamless. We work with your team to tailor an implementation strategy to get the most out of our Advisor Support Program and help keep your business moving forward. © 2019 Pensionmark. Financial Group. Pensionmark® Financial Group, LLC (“Pensionmark”) is an investment adviser registered under the Investment Advisers Act of 1940. Pensionmark is affiliated through common ownership with Pensionmark Securities, LLC (member SIPC).